cInstitute of Diagnostic and Interventional Radiology and Neuroradiology (M.L.H. ), University Hospital Essen, Essen, GermanydDepartment of Neuroradiological Diagnostics and Intervention (M.L.H. ), Medical Centre Hamburg-Eppendorf, Hamburg, Germany. SUMMARY: Life-threatening physical abuse of infants and toddlers is frequently correlated with head injuries. A common variant of the abusive head trauma is the shaken baby syndrome. The present review article sheds light on subdural collections in children with abusive head trauma and aims at providing a recent knowledge base for various medical disciplines involved in diagnostic procedures and legal proceedings. To this end, the different subdural collection entities are presented and illustrated. The pathophysiologic background is explained. Differential and age-diagnostic aspects are discussed and summarized by tabular and graphic overviews. Two problematic constellations frequently occurring during initial CT investigations are evaluated: A mixed-density subdural collection does not prove repeated trauma, and hypodense subdural collections are not synonymous with chronicity. The neuroradiologic analysis and assessment of subdural collections may decisively contribute to answering differential diagnostic and forensic questions. In addition to more reference data, a harmonization of terminology and methodology is urgently needed, especially with respect to age-diagnostic aspects. Acute encephalopathy, being the clinical expression of traumatic damage of the brain parenchyma accompanied by a wide spectrum of neurologic symptoms that depend on the intensity of the trauma. Subdural collections with or without additional extra-axial findings such as subarachnoid hemorrhage, arachnoid tear, or bridging vein thrombosis. Retinal hemorrhages typically found in many locations, within several layers, disseminated, widespread from the center to the periphery, and with or without additional retinoschisis or intravitreal hemorrhage. Spinal trauma such as ligamentous injuries at the craniocervical junction, or spinal sub- or epidural hematomas. No or only minimal injuries of the skin because skin bruises caused by firm grip at the arms or the thorax of the child are rare. Missing or inadequate anamnesis—that is, no trauma reported or report of just a minor trauma despite the presence of severe brain injury. With respect to other variants of AHT, further features of head injury may occur, in particular, signs of blunt force (impact) trauma against the child's head such as skin lesions or skull fractures. Relevant differential diagnoses such as metabolic disorders, infectious and hematologic diseases, and birth trauma must be excluded. However, these differential diagnoses usually cannot explain the symptomatology of AHT as a whole. Diagnosing AHT always requires the joint assessment of numerous investigation results from pediatrics, ophthalmology, neurosurgery, laboratory medicine, forensic medicine, and radiology.7,16 Pediatric neuroimaging by CT and MR imaging plays a key role in this strategy.7,16,17 Traumatic brain injuries and extra-axial indicators of AHT can be depicted and evaluated across time. Besides subarachnoid hemorrhages, fluid collections within the subdural space represent such extra-axial indicators of AHT. The term “subdural collection” (SDC) is understood as a nonspecific umbrella term comprising various, in part, successively stagelike findings within the subdural space. The radiologic investigation of SDCs has the potential to contribute to important issues such as type, number, and circumstances of the traumatic force or the age of injury. Apart from the clinical and medicolegal significance for the diagnosis of child abuse, SDCs may also be relevant for criminological aspects because age estimation possibly facilitates further limitation of the circle of suspects. Differential diagnostics of the various SDC entities is a challenging topic for the radiologist. During the initial image-assessment process, the more careful labeling as SDC may be more reasonable than the possibly hasty determination of a special SDC entity.18,19 Terminology and definition criteria of the SDC entities are inconsistent, even among experts. This issue may partly be attributed to the frequent presence of mixed or transitional SDC forms. However, the large body of literature allows the differentiation of at least the following 6 entities. In the context of AHT, subdural hematoma (SDH) is described as the most common intracranial pathology in infants and toddlers.20⇓–22 SDHs, like all SDCs, may occur unilaterally or bilaterally.23 The convexities of the cerebral hemispheres (Fig 1A), the falx cerebri, the tentorium cerebelli, and the middle and posterior cranial fossae are considered typical locations.22 In many cases, SDHs have a key role as a diagnostic marker only—that is, though they may represent an important symptom of child abuse, their volumes are often small, resulting in just a minor space-occupying effect.8,21,23⇓–25 Hence, frequently, SDHs do not have a prognostic relevance for the extent of brain damage.24 Depending on the developmental stage in which subdural blood is visualized by neuroimaging, SDHs have a wide variety of appearances (Table 1). The chronic SDH has a special position (see below: “Chronic Subdural Hematoma”). SDC entities in AHT cases. A, Acute SDH (nonenhanced CT): a 2-month-old boy with a small hyperdense SDC over the left frontoparietal region (arrow) and hyperdense blood components around the tentorium (arrowheads). B, SDHy (nonenhanced CT): a 2-month-old boy with wide, homogeneously hypodense (or CSF-isodense) SDCs over both frontoparietal regions; no neomembranes or septa. C, SDHy (MR imaging, T2WI, TSE, nonenhanced): a 4-month-old boy with wide, homogeneously CSF-isointense SDCs over both frontoparietooccipital regions, markedly frontal due to the supine position; no neomembranes or septa. D, SDHHy, homogeneous variant (MR imaging, T2WI, TSE, nonenhanced): a 3-month-old boy with homogeneous SDCs over both frontoparietal regions. Compared with CSF within the external and internal CSF spaces, the SDCs appear hypointense. Two intact BVs can be found next to the superior sagittal sinus (arrow shows 1 BV). E, SDHHy, heterogeneous variant (nonenhanced CT): a 19-month-old boy with an SDC in the left frontoparietal region. The SDC is composed of a thin, brain-sided, hyperdense component and a thin, dura-sided, hypodense component that runs parallel to the former component (mixed-density pattern). In this case, the study also revealed severe brain edema with a midline shift to the right side as well as hyperdense blood components within the anterior and posterior interhemispheric fissures. F, SDHHy, heterogeneous variant (MR imaging, FLAIR, nonenhanced): a 4-month-old girl with wide SDCs over both frontoparietooccipital regions. While the frontoparietal SDC proportions appear hypointense, the parietooccipital proportions are iso- to hyperintense. The transitional zone between the 2 components is almost smooth; fluid-fluid levels cannot be recognized unambiguously. G, Chronic SDH (nonenhanced CT): a 7-month-old boy with wide, hypodense SDCs over both frontoparietal regions and subtle formation of subdural neomembranes on the left side (arrows). H, Chronic SDH (MR imaging, T1WI, gradient-echo sequence, enhanced by contrast agent): same case as in G. Confirmation of the presence of subdurally located septa and chamber formations. In contrast to the nonenhanced T1WI (not shown), this contrast agent–enhanced study revealed focal signal enrichment located at the neomembranes (arrows). I, Chronic SDH (MR imaging, T2WI, TSE, nonenhanced): a 4-month-old boy with numerous subdural septa and neomembranes. Note the different signal intensities and multiple fluid-fluid levels within subdural chamber formations, especially in the right occipital region. The term subdural hygroma (SDHy) is classically reserved for proteinaceous, clear, pink-tinged, or xanthochromatic collections within the subdural space containing pure CSF or at least CSF-like fluid; blood, blood products, or neomembranes are nonexistent by definition (Fig 1B, -C).22,26,27 However, the smallest amounts of blood within the SDHy cannot always be excluded and may become noticeable on CT by a slightly higher density compared with CSF (see below: “Subdural Hematohygroma,” “homogeneous variant”). Subdural hematohygromas (SDHHys) are a combination of blood (or blood products) and CSF (or CSF-like fluid).22,28⇓–30 A homogeneous and a heterogeneous variant can be differentiated. In many cases of an SDC diagnosed as SDHy, it may be assumed that the SDC is actually the homogeneous variant of the SDHHy (Fig 1D) because the blood component may sometimes be relatively small and/or very “young” (hyperacute); furthermore, an intense mixture of blood and CSF may be present.27⇓–29 Hence, in our experience, SDHy and SDHHy are used interchangeably or synonymously in radiology reports. Supernatant (and thus an integral part of blood) changed by gravity (serum separation/blood sedimentation/hematocrit effect), in the sense of an SDH. Of course, a mixed form of both variants is conceivable as well (ie, simultaneous presence of CSF influx and blood sedimentation; see below: “Mixed-Density SDCs: Repeated Trauma?” and Table 2, upper part). These proteinaceous SDC entities are predominantly considered sequelae (in case of subdural effusion [SDE]) or complications (in case of subdural empyema [SDEm], eg, due to an infected SDE) of bacterial meningitis or sinusitis.22,39 These conditions usually do not cause diagnostic difficulties because inflammatory symptomatology or a history of CNS infection is typically present. Normally, SDEs and SDEms are nontraumatic, but in rare cases, SDEms may originate following penetrating head trauma or craniotomy, which, of course, is usually known in the clinical setting. BVs show a different wall thickness at different locations. While the BV wall measures 50–200 μm within the subarachnoid space, the BV segments that penetrate the dura mater may have a wall thickness of only 10 μm and do not show additional external strengthening by connective tissue.45 Thus, increased vulnerability of dural BV portions is assumed.45 The resulting hemorrhage from the injured BVs fosters opening of the subdural space. This pathologic space does not exist under physiologic conditions and has been recognized as an intradural lesion caused by cleavage of the innermost part of the dura mater, the dura border cell layer.22,46,47 Nevertheless, the traditional term “subdural” is still widely in use; thus, BV hemorrhage leads to what is generally referred to as SDH. 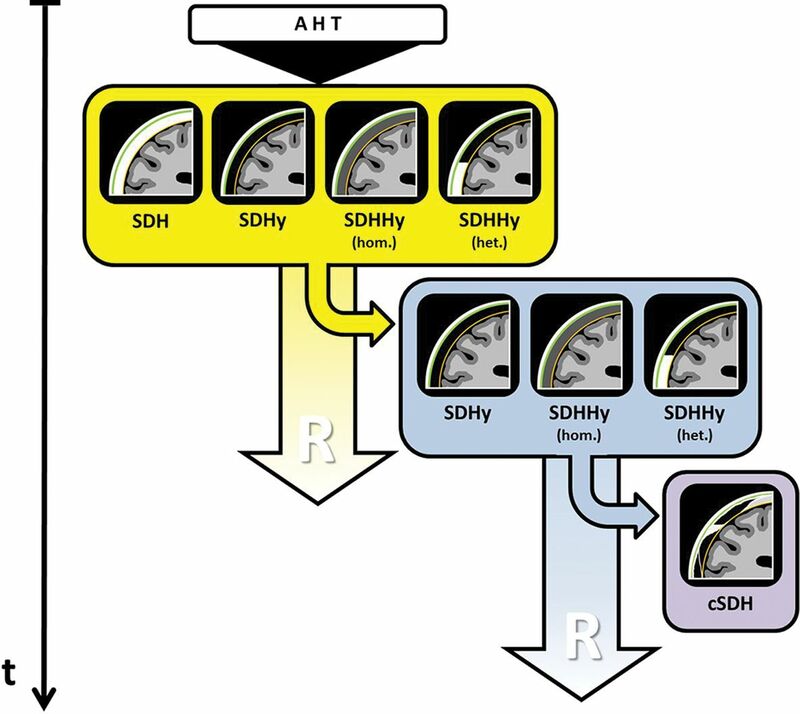 Simplified schematic drawing of the development of cSDHs via SDHys/SDHHys according to Hymel et al,20 Hedlund,22 Wittschieber et al,27 Zouros et al,29Lee et al,34 and Lee.49 The findings within the yellow box demonstrate the possible SDC entities following AHT that can often be found during initial cross-sectional neuroimaging. A portion of these cases develops further toward the findings shown within the blue box. With time, these SDC entities may then develop into a cSDH (purple box). The pictographs schematically visualize the CT morphologic appearance of the respective SDC. Green indicates the dura mater; orange, the arachnoid membrane; the space in between, the subdural space; hom., homogeneous; het., heterogeneous; t, time; R, resorption/resolution. However, the application of a “minimum age concept” might be an improvement towards an age-diagnostic assessment of the SDC, despite overlapping time intervals of stages. The principle is as follows: If a stage X (eg, “chronic”) is found, according to available study data, a minimum time Y (eg, 2 weeks) has elapsed since the trauma has occurred. The fact that the maximum duration of the antecedent stage often overlaps the earliest occurrence of the next stage does not affect the forensic statement (eg, that the SDC is at least 2 weeks old). Thus, more reliable age-diagnostic assessments of SDCs necessitate more reference studies and special training programs, imparting specific diagnostic experiences. These would also require a harmonization of methodology and terminology as a precondition. Furthermore, focusing on the density or signal intensity of SDCs alone represents only 1 approach. 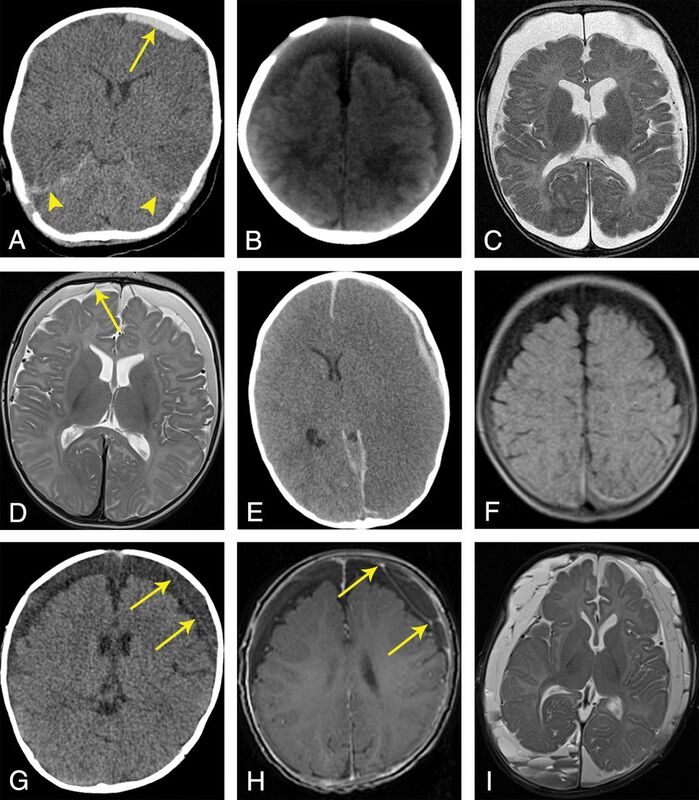 Other imaging findings might have the potential to support the age estimation of AHT cases in the future—that is, parenchymal shear injuries, bridging vein thromboses/venous injuries, brain edema, subdural neomembranes (see also below: “Hypodense Subdurals: Acute or Chronic?”), the size of the SDC, or other signs of brain damage.22,63,71 However, as long as large systematic studies on these topics are missing, being cautious with time-related statements on SDCs is recommended. In the context of the mixed-density pattern, it has been proposed that SDCs with 2 different densities in “2 distant locations” may be considered indicators of a so-called “age-different pattern”60,73—that is, a hypodense frontoparietal SDC in combination with a hyperdense SDC in the posterior fossa, or a hypodense frontoparietal SDC associated with hyperdense clots at the vertex.60 Those patterns were reported to be strongly associated with confessions of repeated episodes of violence against the child, suggesting that at least 2 traumatic events occurred. However, there are numerous reports of hypodense SDCs that formed very early after the reported traumatic event (partly even within a few hours), namely without an additional trauma and also on the contralateral side of a hyperdense SDC observed initially.22,27,28,37,69,70 One possible explanation for those observations may be arachnoid tears resulting in CSF accumulations within the subdural space corresponding to acute formation of an SDHy or SDHHy. Hypodense Subdurals: Acute or Chronic? The presence of isolated iso- to hypodense SDCs is another typical problem in CT investigations of SDCs (Fig 1B). At least 5 possibilities of interpretation, besides SDHy and SDHHy, compose nearly all time-related SDH stages from hyperacute to chronic (Table 2, lower part).22 Hence, a reliable diagnosis and age estimation of the SDC are frequently not possible without additional MR imaging and serial neuroimaging, respectively. The diversity of differential diagnoses shown in Table 2 illustrates that the diagnosis of a chronic process (cSDH) may be hasty. SDCs in infants and toddlers represent frequently occurring indicators of AHT. The radiologic analysis and assessment of SDCs remain a challenging task because different SDC entities may appear radiologically very similar at different developmental stages. As long as no harmonization of terminology, methodology, and age diagnostic criteria of SDCs exists and as long as the scientific data situation has not improved, only rough time-related statements on SDCs will be possible. However, such statements may be helpful if a “minimum age concept” is applied. For example, it is possible to exclude that wide hypodense SDCs with neomembranes formed 2 days ago as suggested by a witness. In summary, as consensually corroborated by a number of leading medical societies,75 the close cooperation and joint evaluation by clinicians, radiologists, and forensic experts remains essential in cases of suspected AHT.